She went on to compare it with then-Sen. Hillary Clinton‘s 2008 “3am Call” ad. Arianna, we love you, but you must be huffing a ton of something to miss the obvious problems with your attack. There’s been a lot of this type of chatter from some of the skin-deep thinkers in the Beltway press, but I expect better from Arianna, former conservative or not. It’s true that raising the bin Laden killing as a campaign issue is a tricky business, but it is possible to do so in a way that is fair, and doesn’t exploit fear. Arianna compared the Obama campaign’s new “One Chance” ad with something that truly was despicable, a fear-mongering 2008 ad that played like a ham-fisted Slomin’s Shield commercial. But that ad was despicable because it wasn’t based on Hillary Clinton’s record, or Barack Obama’s, but on the ill-defined, yellow notion of character that seems to offend Arianna in the Obama campaign’s ad. The Obama ad that Arianna objects to because it suggests “Romney might not have done” what President Obama did, suggests that because that’s what Mitt Romney said with his mouth. 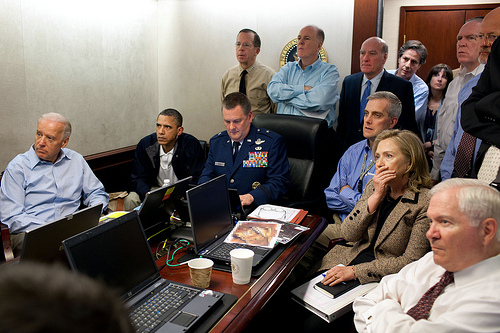 When Barack Obama vowed to go into Pakistan to kill bin Laden, whether the Pakistani government liked it or not, Mitt Romney repeatedly criticized him for it. I agree that it would be unfair to say that a different president wouldn’t have moved Heaven and Earth to kill bin Laden, wouldn’t have made the call that President Obama made…unless that person said those actual words with his own mouth-hole! Which is what Mitt Romney did, with spooky specificity. “I do not concur in the words of Barack Obama in a plan to enter an ally of ours,” he said, a sentiment echoed by many of President Obama’s advisers in that Situation Room, advisers that he overruled. To bring that up is not only fair, it’s absolutely necessary. Meet The Press‘ David Gregory also compared it to a Clinton ad that used footage of the Twin Towers wreckage, which is, again, a despicable thing that the Obama campaign is not doing in its ad. Gregory also, annoyingly, ignored Romney’s amazingly predictive denunciation in painting the President’s campaign with the same brush as the yellow, fear-mongering campaigns of the Bush era that the Clinton campaign mimicked in 2008. Arianna should be calling Gregory out, not piling on. What’s truly stunning, though, is that Arianna Huffington and David Gregory not only missed (or ignored) the fact that Mitt Romney flung this door wide open by attacking the President in the 2008 campaign, and trying to minimize the credit for the raid in 2012, they also missed one of the most despicable displays of yellow fear-mongering I’ve ever seen: Mitt Romney’s 2008 concession speech, in which he cast his surrender to John McCain as a patriotic act meant to prevent Barack Obama or Hillary Clinton from “surrendering to terror.” Again, this was said with his own mouth-noises. Did he mean “surrendering to terror” like this?